why does this error happen in Keras,"Graph disconnected" when I want to separate whole network into two models? Can I do data augmentation with gaussian blur on my tf.Dataset using my GPU? How to do distributed train using train_image_classifier.py in tensorflow-slim API? Why is Tensorflow segmentation network returning empty data when setting session parameter is_trainning as false to batchNorm layers? I added shuffle=false and set num_readers=1 in the script, trying to let the data_provider() read data in sequence without parallel jobs. I also modified image_preprocessing_fn only to resize image, not to do flipping/cropping/distortion. For tf.train.batch(), num_preprocessing_threads=1 is set in script. Do I miss anything above? It seems like some data was missed or read disorderly. 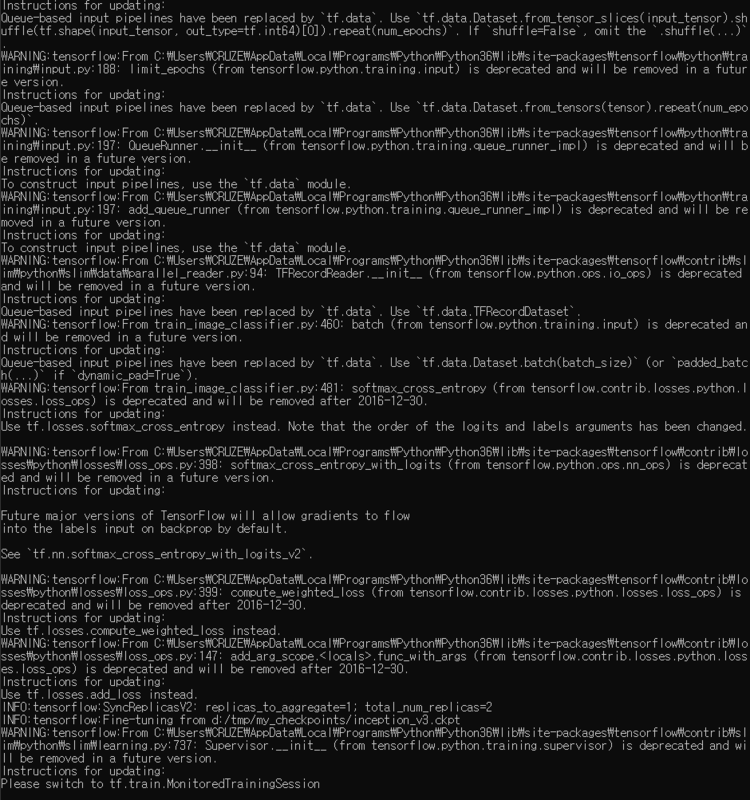 I did the same modification in eval_image_classifier.py. The evaluation works fine without the problem. I have an autoencoder in keras and I need to define a different model for each part because my network has two outputs and I want to have two separate network for each output during the test, but when I do this it produces the following error. I want to have two networks during test one of them from the encoder to end of the decoder and second for w extraction part. what is the problem? Thank you. x_validation = x_validation.astype('float32') / 255. I would like to change my old queue based pipeline to the new dataset API on tensorflow for reasons of performance. However, once my code changed, it runs in 8 hours instead of 2. The use of my GPU was about 30/40% and it's now between 0 and 6%. With my old queue-based pipeline, this line almost doesn't slow my program. I think it's because this line used to run on the GPU but the new dataset API forces it to run on the CPU which is way slower and already 100% used. Do you have any idea on how can I apply gaussian blur with out decreasing so much the performance? Should I keep my old queue based pipeline? As I am more a software engineer then a scientist, I want to write unit tests for this function to test whether the output is what I expect it to be. The problem, however, is that this function, as it is, performs 3 separate operations: matmul, masking and softmax. I would prefer to determine that each of this operations does produces correct output, but as it is I could only check the final effect. This leads me to a design where I would wrap each of this 3 operations to a separate, dedicated function and test them separately. What I am concerned, however, is that the overhead of python functions calls in a training loop function that is called on each forward pass may be unnecessary. Thus, the question is, what would be the correct approach to balance design and reliability vs performance in this scenario? How does one convert a tensor of shape (4, 10, 3, 368, 368) to (40, 3, 368, 368). I am not able to find any documentation on this. I could hand code it but I'm sure there is any easier way to flatten the first two indexes. I'm trying to concatenate outputs of two concurrent Slim ResNet-v1-101 models with last layer (logits) removed. My goal is to 'grab' the outputs from last blocks of each branch, concatenate it and reduce it to [batch_size x 1 x 1 x num_clases] tensor, so having [batch_size x num_classes] lables tensor I could easily compute sparse_softmax_cross_entropy. Here, the batch_size=2 and num_classes=3. tensorflow.python.framework.errors_impl.InvalidArgumentError: Can not squeeze dim, expected a dimension of 1, got 3 for 'sparse_softmax_cross_entropy_loss/remove_squeezable_dimensions/Squeeze' (op: 'Squeeze') with input shapes: [2,?,?,3]. The error makes sense - the last layer is Tensor("conv3_1/Relu:0", shape=(1, 1, 512, 3), dtype=float32) - it is a 1x1 convolution with 512 input and 3 output filters. 1) Am I concatenating the model outputs correctly? Is last conv of the last block a good place to get a handle? 2) Considering I have an output of correct size (batch size of 2 and 3 output filters should give [batch_size x ? x ? x num_classes]) - why does loss op complain? 3) Is there any other problem with my solution that causes it to fail? I want to do distributed train using train_image_classifier.py in tensorflow-slim API. I have 2 machines that consist of each GPU. And Same O/S is windows 10. Is the script "train_image_classifier.py" able to do distributed train on 2 machines? I'm working with a a neural network for image segmentation using Tensorflow. The training phase and inference run are ok if the is_traning parameter of the slim.batch_norm layer is set to True. But when i run the session using is_training as false, meaning (in what i understand) just infering/forwarding data through the network the result segmentation image data comes out empty. I believe it has to do with batchNorm layers but i've already lost my mind over it and i just can't make it work. I'm using a code based in Semantic Segmentation Suite in TensorFlow. Below is a simplified version of what works and what fails. The training works well, and the net converges and all.... and If i allways keep the placeholder net_training as True, all is well. But is i invoke the sess.run(model,...net_training: False) as you can see in the code above while testing some images the output result comes out empty. What i'm i doing wrong guys? Any help would be highly appreciated. Thank you for your time. I would like to clarify some points on the input to tensorflow models/research/slim nets api. The preprocessing_factory points to vgg_preprocessing. This seems to take as input values in [0, 255]. But in this github issue, one of the authors of tf.slim says that resnet v2 (maybe also v1?) should use inception_preprocessing, which apparently takes as input values in [0, 1]. Despite this comment, the preprocessing_factory file was not updated, neither for Resnet V1 or V2, still pointing to vgg_preprocessing for both. If one initializes the model with the slim pretrained ckpts? If the model is randomly initialized?